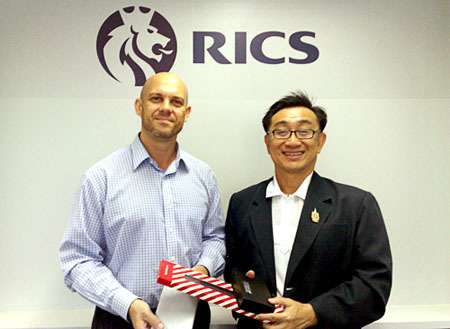 Dr.Sopon Pornchokchai, MRICS, President, Agency for Real Estate Affairs went to visit the office of the RICS (Royal Institution of Chartered Surveyors) Asia where he is a member. He was welcomed by Mr.Darren Jensen, Director, RICS Asia. He first went to the headquarters of RICS in London in 1999 and met a few RICS Presidents at different occasion.